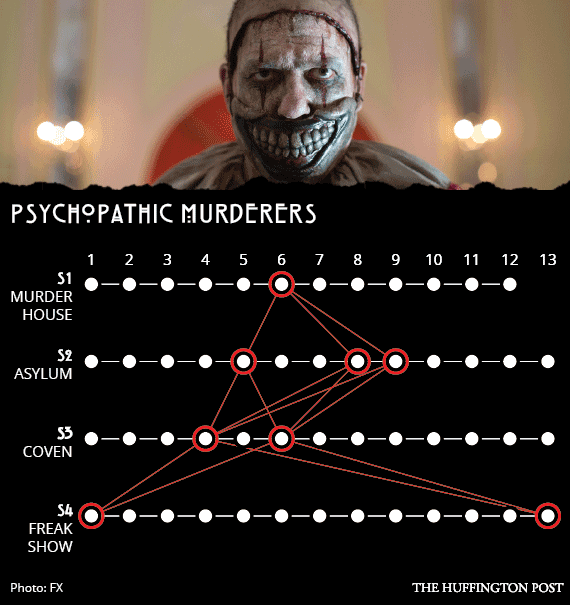 Fans of American Horror Story love to debate the interconnectivity between the different seasons of the show but this detailed analysis by Erin Whitney explores every connection between the four seasons and theorizes about what’s to come in season 5 and beyond – enjoy! Ryan Murphy does not seem like a man to meddle with coincidence or to accidentally reuse surnames. Thus, we can only assume that Dr. Charles Montgomery, the famed “surgeon to the stars” from Season 1, has some connection to Emma Roberts’ Madison Montgomery in Season 3. Charles moved to Los Angeles with his wife Nora (Lily Rabe) in 1922 in “Murder House” and we meet Madison in present-day 2013 in “Coven.” Could they be relatives? The state of Massachusetts somehow finds a way to pop up in every season of “AHS.” In Season 1, the Harmon family moves to L.A. from Boston (and Ben also visits Boston briefly). Briarcliff Manor in “Asylum” was built in Massachusetts in 1908 as a tuberculosis ward, and then taken over by the Catholic church in 1962. Season 3 flashes back to the Salem witch trials, and Queenie mentions she’s a descendant of Tituba. In Season 4, we get a flashback to Elsa working at a Boston circus in 1936, and Pepper also goes to live with her sister Rita in Sudbury, Massachusetts in 1952. Remember that Los Angeles detective from Season 1 who visited Ben multiple times about his missing patient? Remember his name? It was Det. Jack Colquitt, played by Geoffrey Rivas. If you were paying close attention during “Freak Show,” you probably noticed that the detective who investigates Elsa and her “freaks” about the missing police officer (and who throws Jimmy in jail) was also named Det. 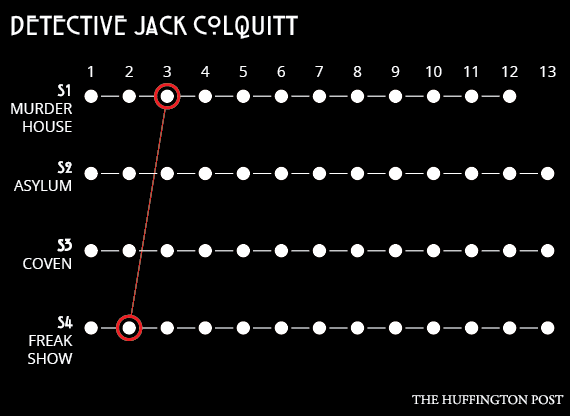 Jack Colquitt. Although he was played by a different actor: P.J. Marshall the second time around. Maybe he travelled in time to 2013, or maybe the “Asylum” aliens are behind this? Who knows. Murphy said all the seasons were connected and he delivered, finally revealing Pepper’s origin story. 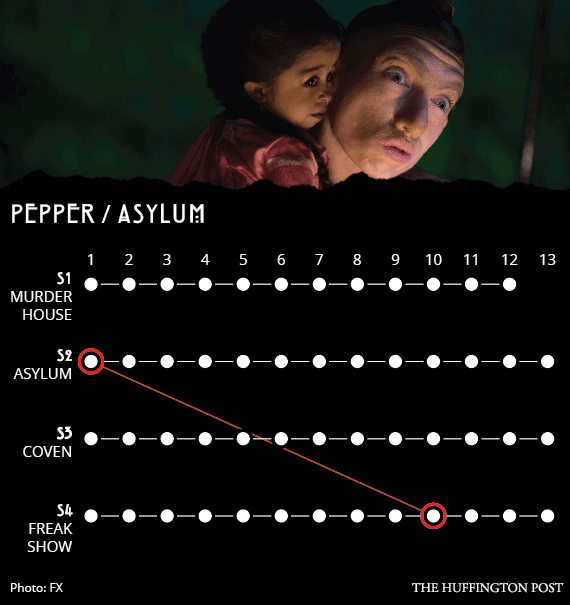 We first met Naomi Grossman’s beloved character in 1964 at Briarcliff, but “Freak Show” told Pepper’s history as an orphan taken in by Elsa Mars. Season 4 revealed that after Pepper had gone to live with her sister and brother-in-law, the two conspired against her, murdering their own baby and framing Pepper for it. Flash forward to 1962 when Pepper is brought to Briarcliff, meets a pre-Satanic Sister Mary Eunice, and sees Elsa on an old cover of LIFE magazine. Seasons connected, BAM! This is second major connection between “AHS” seasons that we know for sure. 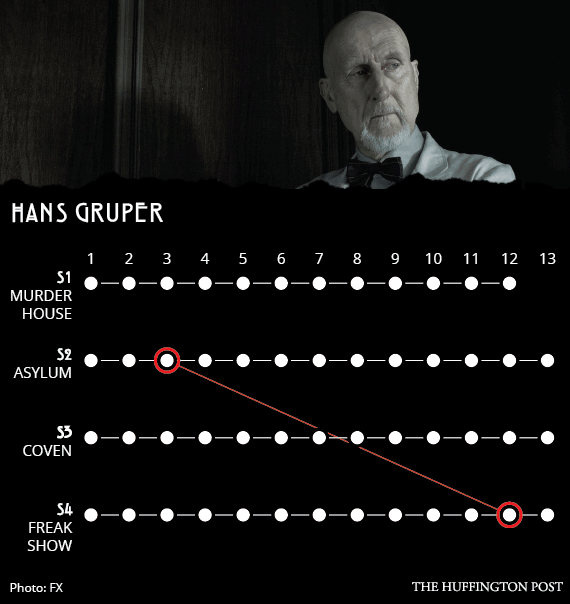 The penultimate episode of “Freak Show” revealed that the “Asylum” physician Dr. Arthur Arden, neé Hans Gruper, was the same German who surgically removed Elsa’s legs in 1932. (James Cromwell’s son, John Cromwell, played the young Hans in Season 2, as well as Season 4.) It only makes sense that the same sadistic doctor to chainsaw off Elsa’s legs would come to the U.S. to experiment on patients, and then removed Shelley’s legs in 1964. 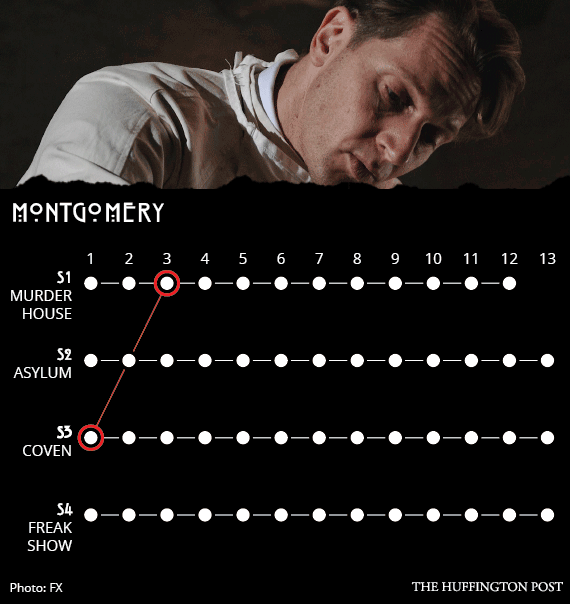 While your typical crazy killers may not seem like much of a connection on the surface, Murphy has created such a fascinating array of deranged murders that we can’t help but wonder if any of these guys are related (or at least if they heard of each other in their respective eras). First, there was Tate Langdon, the misunderstood teenager who killed 15 of his classmates in 1994 in “Murder House.” Season 2 was filled with a lineage of serial killers beginning with the original Blood Face (aka Oliver Thredson) and his son Johnny Morgan, as well as the modern-day copy cat. “Asylum” also had Leigh Emerson, the Santa Claus murderer who killed 18 people in the Christmas Spree Killings of 1962. Then Season 4 gave us two of the most terrifying murders in “AHS” history: Twisty the Clown and the purely psychotic Dandy Mott, who (similar to Tate’s killing spree), shot and killed almost the entire “Freak Show” troupe in the finale. 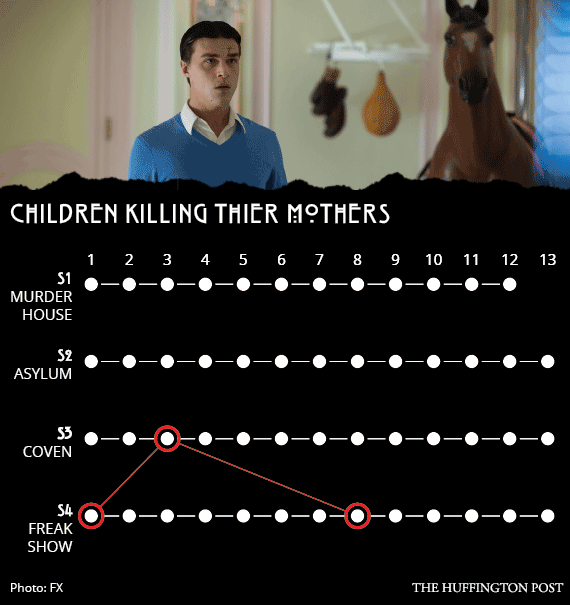 It’s no news to fans that “AHS” is littered with mommy issues, from Constance’s relationship with her children in “Murder House” to the disturbing mommy-son trauma in “Asylum.” But kids also always end up murdering their moms. In Season 3, Evan Peters’ Kyle killed his sexually abusive mom, and in Season 4, Bette stabbed her mother while Dandy later killed (and then bathed in the blood of) his mother Gloria. Does this hint at something else (or has Murphy run out of ideas)? 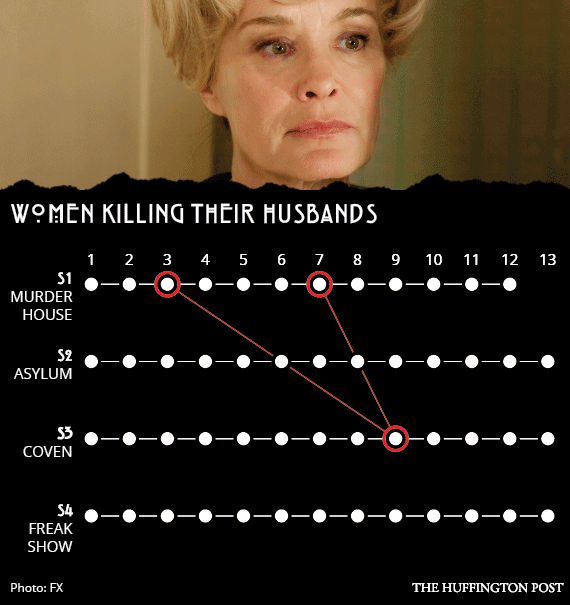 Obviously murder is a recurring theme in the anthology series, but there’s something interesting about women murdering their husbands, usually over infidelity. First there was Constance, who shot and killed her husband in 1983 for sleeping with Moira the housekeeper. Then later in the season, it’s revealed that Nora Montgomery shot and killed her husband Charles, before taking her own life. In “Coven” there was also Patti Lupone’s Joan, who killed her husband for cheating by filling his car with bees. We doubt this theme is long from over. Florida is another state that has piqued fans interest. It’s where “Freak Show” takes place, while in “Murder House,” Vivien Harmon mentions she has family in Florida. One fan theory from Redditor tinyshroom is that the doctor who Desiree visits in Season 4 (the one who allegedly kills himself) may be a distant relative of Vivien’s, especially since the doctor’s daughter mentions she is from Boston. Last, but not least is the one true “American Horror Story” survivor. Sarah Paulson has lived till the end of each season and her characters always have some sort of relation to television. In Season 1, Billie Dean Howard alluded to her upcoming Lifetime TV special (can we please see this as a spin-off one day?). In Season 2, Lana Winters told her survival tale in a live TV interview in 2012. In Season 3, Cordelia was revealed as the Supreme and discussed witchcraft in a local news interview. And in “Freak Show,” Bette and Dot survived and watched Elsa Mars’ Halloween special live on TV (before quickly shutting it off). Here’s a pitch idea: give Paulson her own reality show in Season 5. Legendary Building Up To King Kong Vs Godzilla?